After that "quilt" was done, I had this little strip of polar fleece left over. Definitely not going in the garbage! It decided to follow the rest of the cream polar fleece to Prince George in the guise of a scarf. That would be for my daughter, not her fiance. I saw something similar in the Kwik Sew catalogue when I was browsing, but with a strip the size that I had - not even worth buying instructions for. This took well under a half hour, even with time spent on figuring out my spacing for pleats. And believe it or not, I actually had the presence of mind to snap pictures along the way - and they actually came out so that you could see something. Here goes! Lay down a curved ruler from the middle point to the side to make a "pleasing" (I always liked it when I saw this word used in older instructions) slope to a point. Repeat for the other side. And now you have this. Draw a line down the centre from point to point. This will be the stitching line as well as the line that will keep you pleats straight. (Heaven forbid should the pleats be wonky!) From the end I came up 4 inches and made a 1/2 inch pleat (taking out 1 inch total). At centre back I reversed the direction of the pleats. In other words - pleat from either end till you meet up in the middle. Final step - stitch down the centre line from the first pleat to the last. Finishing touch - beat the scarf to get rid of all the "fluffies" from cutting the edges. Or, you may choose a less violent method of achieving the same results - lint rollers do come to mind. I always tell people that I do not quilt. So, please don't let the cat out of the bag that I actually made up a pseudo-quilt! I've had this fish fabric for a long time. I didn't buy it - definitely not my style. Must have been "inherited". Every so often I would think to give it to Goodwill, but then I would reason that it just might come in handy some day. Why, I couldn't explain, but I had this feeling. So there it lay, taking up space. I now have a future son-in-law. That's one person who I don't really know well at this point in time. I do need to include something in the Christmas present box for him. It can't all be for my daughter. I thought long and hard with no brilliant ideas forthcoming. Finally I asked my daughter what would be a good present. She remembered the fish fabric. A throw blanket for watching TV! The fiance is a fishing and hunting kind of guy (I guess they come that way in Northern BC). The fish sort of work with that theme. I did a lot of calculating and cutting and sewing and more cutting and sewing. I really do know why I would make a horrid quilter - it's boring sewing! Nevertheless - I did actually get this done. I did take the easy way out with the back. Bought a square of polar fleece to stitch down the fishy top. I even got lazy with the edges. No binding! I just wrapped the polar fleece, stitched all the way around and trimmed. That was a lot of stitching! Moral of the story - never get rid of odd fabric - you never know when the appropriate recipient might happen along. I thought of making up this stretch velvet fabric years ago, but somehow just never got around to it. Now it's wearable. I had two "pieces" - one a remnant, the other was bits and pieces left over from my daughter's Christmas outfit from who knows how long ago. Both are sort of coppery, though different shades. Simplicity 3536 was also sitting around for a few years. View A is the only that caught my eye at the time that I bought the pattern, though perhaps View C might happen at some point - or it might not. Oh, right - I'm supposed to insert the picture at this point. Ta-da! Construction was simple. I was rather surprised that I needed no alterations. I did have a bit of a fight with the elastic that forms the ruching, though. There are supposed to be two bits of elastic at the sleeve hems. I used clear elastic at the centre of the sleeve - had a bit of a squabble with it - that was while the sleeve was still flat. Once I had the sleeve seam put in I decided that I was not going to attempt the bit of elastic on that side of the sleeve. So - my sleeve doesn't quite look like the pattern. What else is new? For the side seams I used a different elastic - still squabbled with it, but not as badly as with the clear elastic. At some point I do intend on redoing the ruching some other way. I'm just not happy with the elastic bits. This is the top that was being hemmed at the last minute, well, actually half an hour before I was to get dressed to go to a party. the usual excuse - oh, it will only take me a few minutes... I do like this top. It's like wearing a t-shirt. (Well, it is one, duh!) I'm not so sure that cowl neck tops are for me, though. The cowl never stays quite right. One probably needs something more than I have to hold the front of the bodice in place. May-be I just need a different type of cowl. I have the same problem with the infamous Donna Karan dress that everyone (including me) made up this summer. Oh well, at some point I do have the intention of actually working through this "problem" and experimenting, because I do like cowl necks. This is the one made from bits of Taya's outfit. Perhaps I should not have used a raglan sleeve pattern, but ... I did. It was Kwik Sew 3120. The sleeves turned out 3/4 length. Having stuck it all together, I just wanted to find a quick way of finishing things off, hopefully with a bit of flare. Don't know that I'm ecstatic about the results, but with a few accessories - it works. Had to sew the lace on by hand (just happened to have this little piece in the drawer! ), because it slipped and slid and did all sorts of nasty things on the velvet. OK - that wasn't so quick, but I really have no problem with hand sewing, so - not so bad. Then I "happened upon" a piece of folded knit binding in another box. Again, just long enough to finish off the neckline. Even that wasn't all that quick - more slipping and sliding and requiring several rows of basting to keep it in place long enough to stitch down with twin needles. FYI - taking pictures has been a challenge. We've hardly had any sun for eons. The best I've been able to do is to switch on all the lights in the room and hope for the best. Colours are coming out not right. (Pants in the pictures should be jet black - so that just shows you how "off" the colour is.) I know that my photography isn't the best to begin with, but I keep hoping for miracles. I'll just keep trying! I'll be playing catch-up for the next while. Sewing happened. Even picture-taking happened (though not the best, necessarily). Sitting down every time to write - didn't happen. So, we'll take it one project at a time (because I don't have the patience at the moment to sit through too many pictures downloading). This year I decided that I would be ready ahead of time for holiday parties. Not that I don't have stuff to wear, but it seems that every year I stand in front of the closet, pondering what to wear when someone says to "drop by". Every year I grab the same old stuff, and frankly, it's gotten rather boring - at least to me. So - this year - an actual plan. A few tops that can be worn with existing bottoms (well, as it turns out with the same pair of basic black pants) that will look at least a little like they're going to a party. First one that got done was a dark cream peasant blouse in silk broadcloth for my "bohemian look". 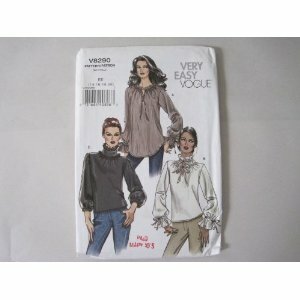 I used OOP Vogue 8290. Here's the way I'm planning to wear this on New Year's. I was planning a velvet cord belt with beaded tassels, but may-be I'll just give myself a break and wear this one. Just wanted to wish everyone a very happy Christmas! Guess it's OK to show you this one, since it has already gone to its recipient and even been opened. Sorry for the slightly fuzzy pic - one quick snap was all that I could manage before having to get this present into its box. Done! Finally! Whew! This poor coat has been "in the works" for an awfully long time. I bought the fabric a few years ago with the intention of making up a coat almost immediately. Plasticky polyester in a dreary rainy-day colour. Even bought a pattern at about the same time. One thing and another... Then my son asked for a vest with a hood - the "wearable umbrella". That darn hood took up an awful lot of fabric. Now I didn't have enough fabric for the coat that I had wanted. Darn! Thinking. Thinking. Thinking. Thinking takes up a lot of time. Early this fall I decided that I was just going to buckle down and get this coat sewn. It seemed that every pattern that I looked at needed much more fabric than what I had. Dig, dig, dig in the pattern drawer. Dug up Vogue 9953. Easiest coat on the planet - only a front and a back (sleeves already attached). Layed out the pieces - it fit! I did have to piece the facings. Onwards! But this was turning into an awfully boring coat. Boring colour (it does match my brown and green plaid umbrella! ), boring style. It needed at least one redeeming feature, besides the endless rows of topstitching. Thinking. Thinking. More time goes by. Decided to do something with the collar - probably because I've been watching too many episodes of House of Eliott, and they have the most phenomenal collars on their coats. The stand-up collar grew. Still boring. Let's do some embellishment. Pintucks! 90 rows (yup - I counted) of pintucks later I had a piece to cut my upper collar from. Mind you - all other sewing stopped while the pintucks were happening. Once I had the machine threaded and adjusted for those double needle pintucks, I was not going to mess up those settings for anything. Very slow going. That's why I was counting rows - sort of a countdown. Finally I got to the point of hemming, and did I ever goof. I thought that I was going to be very smart and stretched the bias interfacing as I was stitching it to the edge of the hem. This was going to neatly ease in the excess fabric of the A-line skirt. Wrong! Not so neat and nice. Undid that before proceeding with a little more caution. The last bugaboo was the buttons, or rather how to do up the buttons. The pattern actually has a hidden fly placket thingy to hide the buttons. This was not so convenient on the previous coat made from this pattern, and I really had no extra fabric for extra pieces. More thinking. Didn't want stitched buttonholes. Didn't want buttonholes of any kind. Wouldn't look right. Loops! Self fabric loops didn't work. The spaghetti strips turned out too fat for the size of buttons that I had picked. Round elastic at Fabricland just wasn't anywhere near the right colour. The solution finally came to me at the dollar store. Hair elastics! So there I stood at Dollarama, fabric swatch in hand, pawing through endless bundles of hair elastics. Who knew that there were so many variations on beige and greige in hair elastics! Not a perfect match, but they had to do. And now that it's cold and at times snowy - I finally have the raincoat done. Well, come spring it will be waiting in the front closet for its first outing. The fabric was at least willing enough to wrap itself nicely around the snap. These buttons remind me of basketballs. OK - may-be a bit too much staring at this coat. Sorry - the lining is just boring grey. I had lots of it and it worked. What can I say. I've been sewing in bits and pieces - sometimes even for a few hours straight, but somehow it doesn't amount to much for show and tell. Five pairs of boxer shorts for my son - didn't take pictures. Do I really need to show my son's underwear to the world? Then my daughter requested that I send her Christmas tree ornaments. Packing them was going to be a challenge. Those that are most breakable I decided not to send. There was still quite a boxful. To line the box, I decided to make something useful. Hot pads. (Trivets? - or are they only called that when they're made of a hard material?) I "discovered some bits in my box of Christmas fabrics and stitched these up. Even at age 24, my daughter still likes "cute". I do think that these pieces have been in the box for some time. When were these Daisy Kingdom prints popular? Decades ago, as I recall. In the works - a raincoat that will likely not see the outside world till spring, But I really need to finish it and get it out of the sewing room, so that I can continue with other projects with a clear conscience. This one has been "in the works" since the summer. It finally got finished in the fall. Didn't want to leave it "hanging" as a UFO. Nothing spectacular - chocolate brown silk jacquard in a sort of sand-washed finish. It was meant to replace the exact same design made of something unnatural that is a little worse for wear. 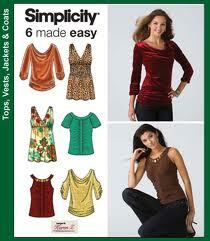 The pattern is old, but the style is rather basic. I can wear it belted or plain. The fabric was a bit of a challenge, as there are thicker threads running along the crossgrain. It was definitely slow sewing (with a microtex needle), and even then every stitch made a strange kachunk sort of sound. Rather unnerving. Otherwise, the fabric is beautiful. I still have quite a lot of this same fabric left in the brown as well as in black. I suppose that now that I've figured out the oddities of this fabric I should be able to deal more confidently with whatever I decide to sew out of the rest of it. By the pattern, this dress is just a pull-on. Didn't like that about the previous version, so I put in an invisible zipper in the back seam. And boring brown needed a little bit of dressing up, so I just "happened to have" a small piece of brown charmeuse to use for piping (conveniently already cut into bias strips!) Sometimes I am happy about not throwing out little scraps. As for the lining - well - I had a piece of georgette that I really couldn't envision as anything, so that's what got used for that purpose. Now originally, the idea was for this dress to go with this jacket, made last year. Opening my closet, I realized that it also went with this jacket. And this jacket (ancient vintage). And this jacket (slightly less ancient vintage). Enough!!! You get the picture. Question is - just exactly how versatile is one dress supposed to be? It's not like there aren't other clothes in my closet to wear. I was only thinking of the first combination when I was making the dress. Fortunately (may-be not? ), if you have a lot of one colour (namely brown) in your closet, things just sort work together without much thinking involved.